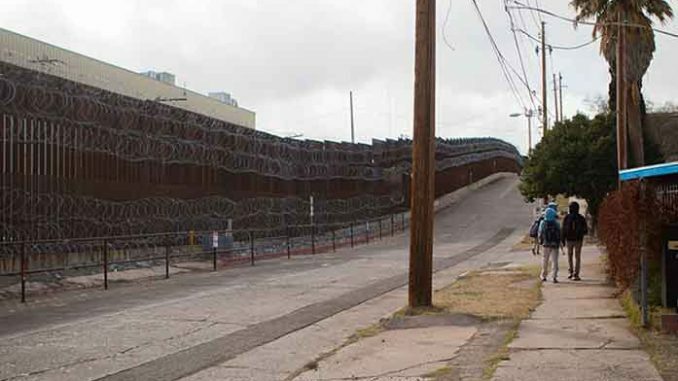 NOGALES – The City Council unanimously voted Wednesday night to approve a resolution condemning the recent addition of concertina wire along the border fence within Nogales city limits. The resolution demands that Customs and Border Protection immediately remove the wire. It also states that the city’s development code bans the use of this type of fencing in areas other than commercial or industrial storage areas and only at a minimum height of 6 feet. Christine Courtland, a resident who frequently walks by the fence, said the additional wiring will potentially scare away visitors, the economic backbone of the city. Before city officials passed the resolution demanding removal of the wire, Nogales residents filed into the small government building on the west side of North Grand Avenue to express their displeasure. “That razor wire against the wall, it made me want to cry. It truly did,” said Sherrie Nixon, who has lived in Nogales for 33 years. According to Mayor Arturo Garino, Border Patrol crews began installing the concertina wire on the lower parts of the fence Feb. 1 to fulfill orders from Customs and Border Protection to fortify the border. Until then, the wire had been strung only at the top of the fence. In a statement, a CPB spokesperson said the additional wire was installed in response to a request for additional support in high-risk urban areas commonly exploited by criminal smuggling organizations. It said CBP is constantly evaluating operational needs and that, currently, there are no plans to remove the wire. 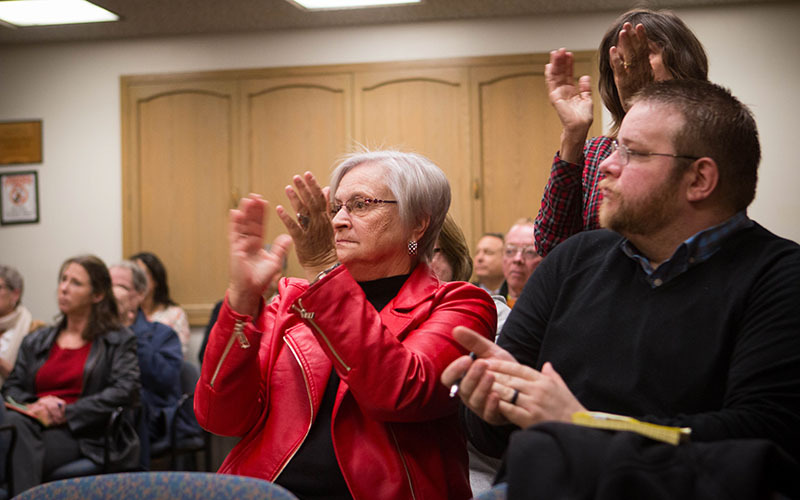 The city council’s resolution said that concertina wire strung along the ground typically is found only on a battlefield or in a prison setting. Garino said that if the city council agrees, officials will “probably start working on a lawsuit” against the federal government. Garino is concerned the concertina wire will be a safety and economic threat. “I fear the day that one of our firemen or police officers have to go there because somebody fell into the wire and they need to excavate that person out of there,” he said. Due to the unsightly wire’s proximity to commercial businesses, Garino said it will deter tourists from the U.S. and shoppers from Mexico, a large component of the city’s economy. “The first thing someone is going to think is, ‘What is on the other side that I’m so afraid of?’” the mayor said. Cesar Lopez grew up along the border and has witnessed the progressive increase in security. “I feel that more of this wire, more of these troops, more of these big military trucks, more armed men, it makes us feel less safe,” he said. More idiots heard from. If they like the ILLEGALS so much leave and go next door. I am sure that they would love to have you. BTW, you can thow you toilet paper in the trash can cause the sewer system in that third world s(*t hole can’t handle the paper. And don’t forget how much money the US has spent trying to control the sewage than runs into Nogales, AZ from the third world s*&t hole…. Could be an awkward question but, isn’t the razor wire on the wrong side? We ARE trying to keep the illegals OUT, right? The other side is Mexico. We have no authority to put razor wire in Mexico. So they don’t complain about it on top of the fence, but now that there’s razor wire lower on the fence it makes them cry? Sounds like a few drama queens to me. Best reply lately by BP, ITS “FED PROPERTY and WILL NOT BE REMOVED”. This was on tv news last night. I visit Nogales regularly. The only people who will be deterred from visiting Nogales are the people climbing over the wall. Traitors to America. time for recall election. I’m surprised that the Prison Reform Bill did not get amended by Democrats to eliminate fences, guards, locks, cells and bloodhounds.Progressives are attempting to choke the life out of our country. They Demand, then let them take care of the illegals. As for it looking like a war zone, I’d bet they’ve never actually seen a war zone. And they must be blind, because these illegal invaders act like they’re at war. Uncivilized rock throwing, destroying anything in their way. what a bunch of Anti American idiots. a war zone is what is needed on the other side to stop the flow of drugs that is killing off the young of our nation – get the intelligence and and drone those facilities. In Mexico and further south as needed – it is a DRUG WAR that to date has been ineffective. IF that ‘drug war’ were effective the oppressed would not need to travel north correct? this is the clear and present danger is it not? You now live in America. I love looking at the concertina wire. It makes me feel more sure. Maybe a good lesson in the constitution might be advisable. Billy it is not necessarily the ‘fault’ of the mex and other countries for drug use. It is played up on tv, in the movies etc as being ‘cool’. I find the fault to be in the citizens of this country who allow the kids to get hooked and then cry later trying to blame anyone but themselves. On the the other day some ol gal was crying about her kid who OD’d. Never did address how he got the $$ or anything to purchase the stuff. DOnt know if it was gotten legally or illegally but there she was. Yes it was a shame but evidently years too late. I have relatives who got hooked on stuff, but they finally got a clue and cleaned themselves up (no not heroin) but the codine stuff and now are good people. It can be done. But it is easier to sit back expect someone else to do their jobs and then whine and cry when it goes wrong. Just like smoking cigarettes. Posted since the 60’s were the dangers for cancer etc, what happens someone dies and the sue for big $$ and the idiots give it to them. Where has PERSONAL RESPONSIBILITY gone? Cut off the users and then the war will become winnable, but until then…………. The border BS has been going on for almost 60 years….. Build the damn wall.